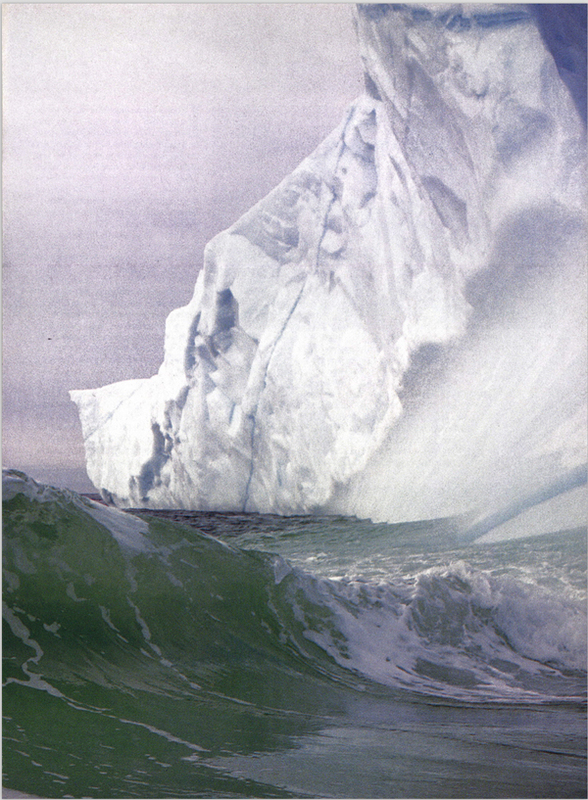 Braving icebergs, the schooner Bowdoin sailed 2,800 miles last summer along the route charted by Admiral Donald MacMillan on his twenty-six Arctic trips, 1924-54, in this venerable vessel. If boats left an indelible trail across the water, like a Jeep on a Down East woods road in mud season, there would be a rut running from Maine to Labrador ten feet deep. That’s the depth of the keel of the venerable schooner Bowdoin, which sailed north out of Boothbay for thirty-three years, from 1921 to 1954, plowing some 300,000 miles of perilous, iceberg infested-waters on twenty-six voyages of Arctic exploration. 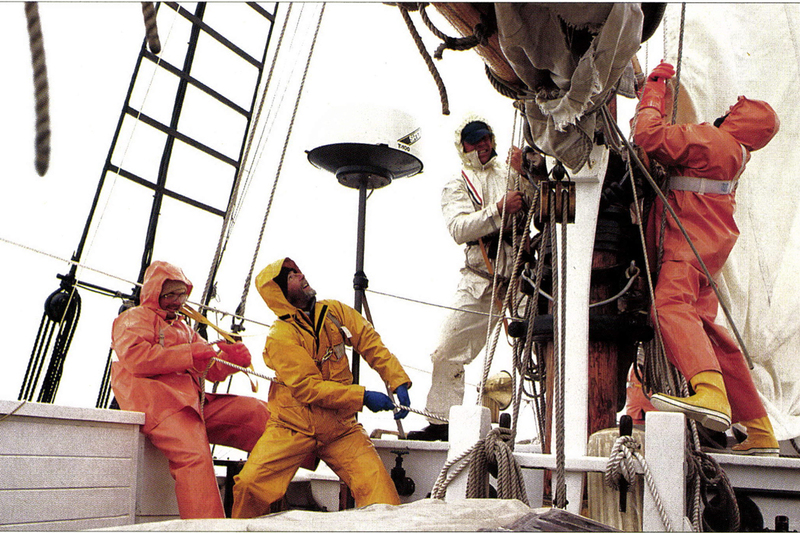 Thirty-six years after the last of those notable expeditions sailed with crews of adventuresome college boys under her original, longtime skipper, Admiral Donald B. MacMillan, a born-again Bowdoin sailed north once more last July 1. This time, however, she sailed from Castine, her new home port, “manned” by a crew of fourteen men and women from the Maine Maritime Academy under Captain Andy Chase. Although there were no visible tracks on the sea to guide the sturdy, eighty-eight-foot schooner on this six-week, 2,800-mile pilgrimage to once-familiar haunts, Bowdoin‘s course to Labrador and back followed closely the wake laid down by Admiral MacMillan. That was possible thanks to old log books, official charts that owe much to MacMillan for the skimpy information they contain, and to the memories of surviving MacMillan crewmen – “Mac’s boys” – who were consulted before the Bowdoin set out once more to recapture her past glory. Glory there was aplenty, especially in the eyes of the native Inuits, Eskimo natives of the Labrador coast, who greeted the great white schooner with a fervor that overwhelmed her crew. 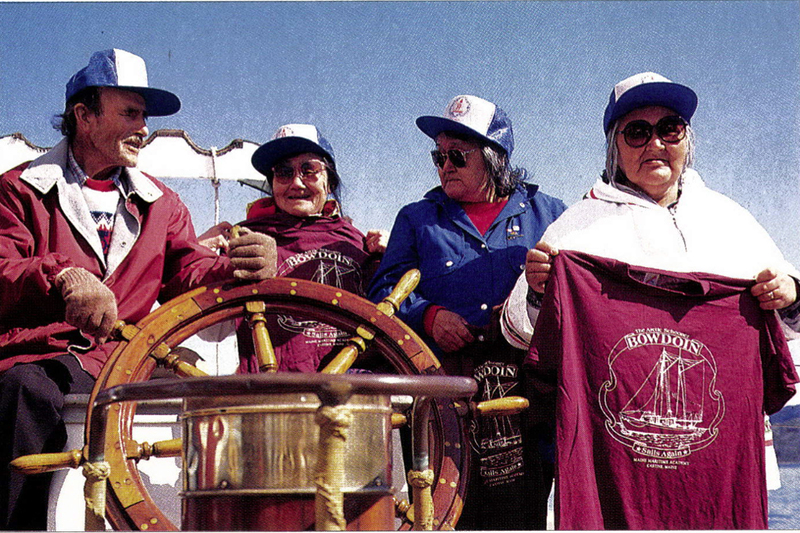 In Nain, the northernmost port, old men stood on the wharf with tears in their eyes, cheering Bowdoin‘s arrival. Later, they came aboard for a sail and slapped their thighs with delight as they pored through old National Geographic magazines that showed these same men as children greeting Admiral MacMillan and his crews. On-deck classes in navigation and sail-handling were daily fare for the fourteen men and women crew members of the Bowdoin during the six-week expedition led by Captain Andy Chase last August. With the mountainous coast of Labrador as a backdrop, and beset by the variable weather of the northern seas, the Maine Maritime Academy students practiced every aspect of handling the vintage eighty-eight-foot schooner — an education that included frequent stints at the helm. It took a tough vessel to survive such groundings, as well as frequent encounters with the Arctic ice pack. That strength is also largely due to the admiral, himself a tough survivor who conceived of this special ship while on a prolonged expedition to the far north during World War I, and who continued to sail her north into his eightieth year. While in his seventies, the old skipper continued to climb the foremast to the “ice barrel,” a barrel lashed above the crosstrees, to con his ship through the ice fields, or into an uncharted cove. The ice barrel was still much used on this latest voyage, although Captain Chase hopes to simplify navigating into uncharted coves by obtaining an inexpensive depth finder to carry on Bowdoin‘s new out-board-powered rubber dinghy. Fog, rain, thirty-five knot winds, and temperatures that often stayed in the thirties for days on end had the ship’s crew scrambling to don snowmobile suits, foul-weather gear, and every piece of wool clothing they’d brought along for the exigencies of the trip. Surprisingly, the Bowdoin did not run into any summer snowstorms. Inuit tribespeople, native Eskimos of the Labrador coast, welcomed the Bowdoin to each northern port with a fervor that astonished her crew. 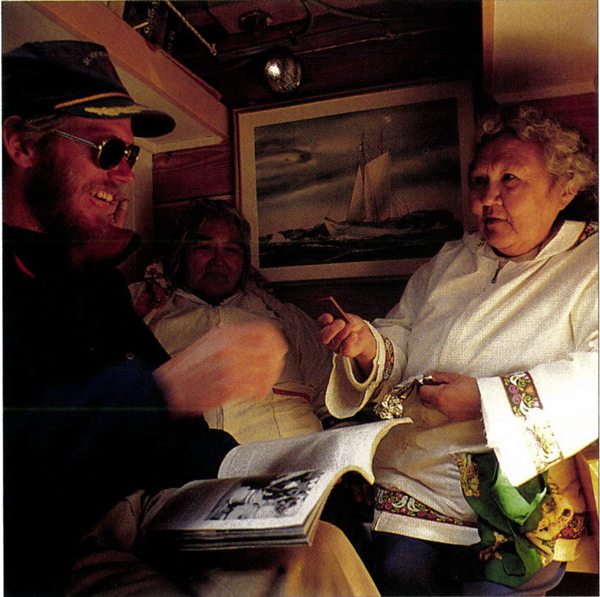 Many Inuit elders remembered the ship from her excursions a half-century before; some even found pictures of themselves as children in the old National Geographic magazines that Captain Chase had brought along, which showed Inuits greeting the ship when it was skippered by Admiral MacMillan. Gift exchanging between the sailors and natives became customary; the Inuits came aboard bearing gifts of caribou meat and salmon and departed wearing schooner Bowdoin T-shirts. 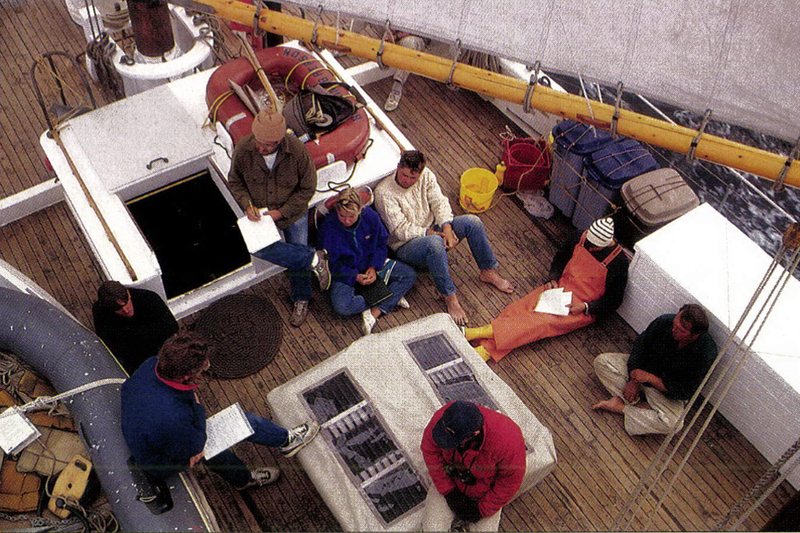 Bowdoin and her crew didn’t run into any really bad weather on last-year’s voyage, although coming home they sat out a hurricane passing offshore in the harbor at St. John, Newfoundland. Their ship encountered little fog along the Labrador coast, Captain Chase reports, because you don’t have the collision of two currents, one cold and one warm, that you have in the Gulf of Maine. Unlike some other recent expeditions to that northern area, Bowdoin did not experience any summer snowstorms either, although the crew did go ashore to build a snowman on a mountain snowfield that dropped close to the coast. Labrador was cold. The temperature in August fell as low as thirty-eight degrees, and, Chase says, it felt a lot colder because of wind and rain. The crew piled on all the clothes they had — snowmobile suits, parkas, heavy-weather boots, wool socks, and mittens — and vowed to bring even more warm clothing on the next trip north — which will be above the Arctic Circle. 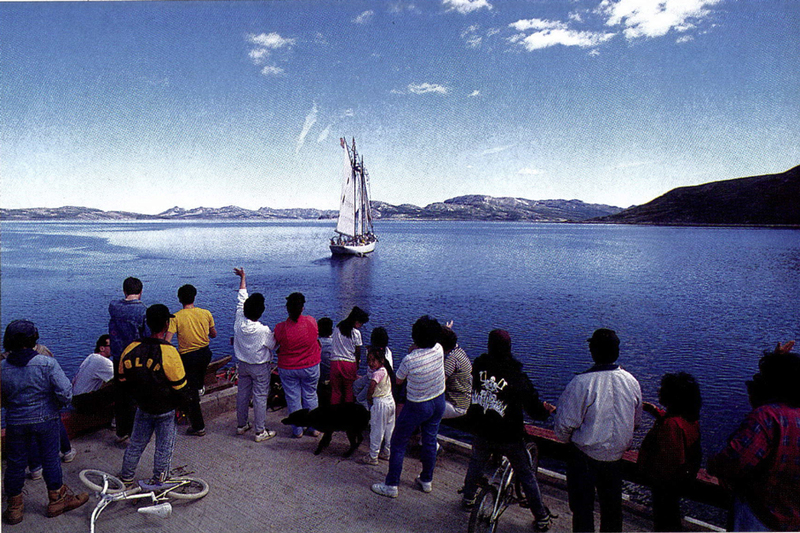 At the end of the northbound expedition, the Bowdoin set sail for her home port of Castine, leaving behind a throng of well-wishers and a promise to sail still farther north this summer on a 4,600-mile round trip to Disco Island, several hundred miles north of the Arctic Circle, off the coast of Greenland. 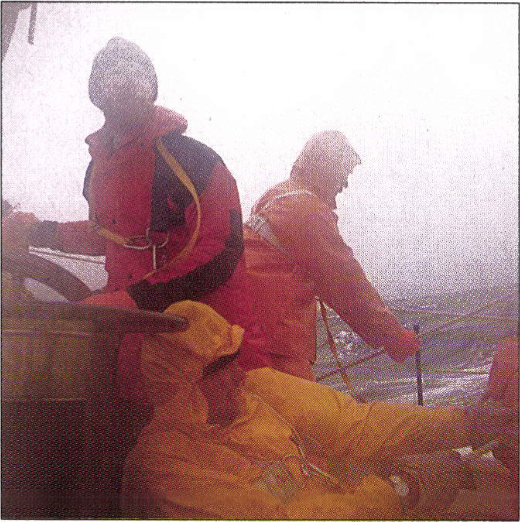 The heaviest weather of the trip was a thirty-five-knot blow that struck during the passage north. “She could handle that easily,” says Chase, “but we were trying to get dead to windward in a twelve-foot sea and weren’t making much headway, so we finally doused all sails and used the engine. On the other hand, late last October on the last sail of the season, we had forty knots of wind and a relatively calm sea in the sheltered waters of Penobscot Bay. It was just her cup of tea. 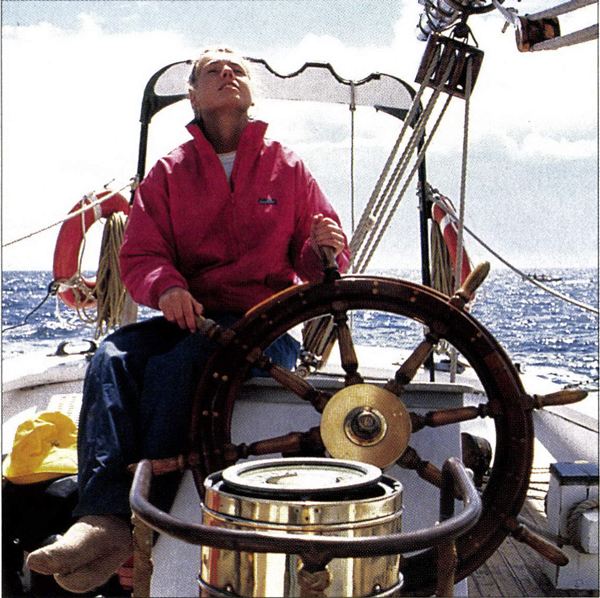 We ran off on a broad reach with single reefed main, and full fors’l, stays’l, and jib. She stood right up to it, logging a steady 10.8 knots over a period of four hours. That was very impressive. She’s fabulous, as good a boat as you can get. 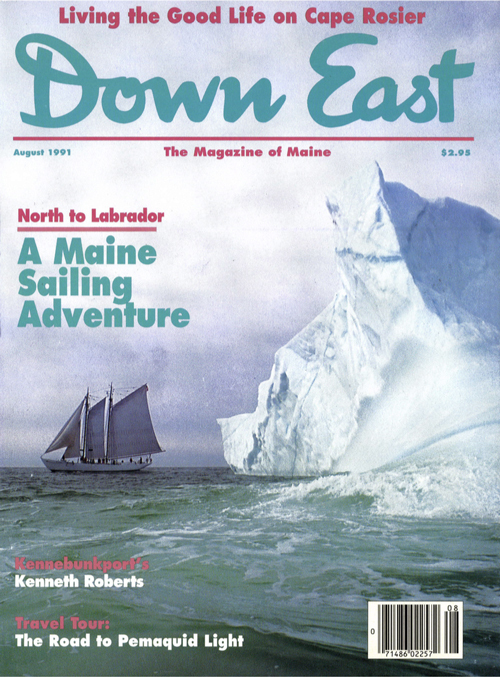 August 1991 Cover: Riding the seas in a small inflatable boat, photographer Tom Stewart captured this once-in-a-lifetime portrait of the restored Arctic schooner Bowdoin emerging from behind a monumental iceberg off the coast of Labrador last summer while the vessel was on a Maine Maritime Academy expedition. “I love to handle this boat,” the tall, lean, red-bearded skipper continues. “I try to let the mates handle her some, but I hate to do it, because I like handling her myself so much. She maneuvers beautifully under power. You can dock her and get almost anywhere under power. You could do it under sail, too. I haven’t tried to dock her under sail though, because it would be hard to justify the risk. I feel I know her well enough and probably could do just fine, but if anything went wrong, how could I justify having tried it? Just to show off? Her skipper may not like to show off on his own account, but Captain Chase likes to show off his schooner, reborn thanks to the dedicated efforts of the Schooner Bowdoin Association, formed by some of “Mac’s boys,” who spent $750,000 in a long and agonizing reconstruction effort before finally turning her over to the competent hands of Maine Maritime Academy in 1988. Following the successful shakedown to Labrador, Bowdoin will sally still farther north this summer, to Disco Island, north of the Arctic Circle, off the coast of Greenland. The voyage, set to get underway on June 30 and to end on September 4, will cover 4,600 miles, including some rugged sailing across the Davis Strait. “It will be rough,” predicts Dr. Edward Morse, of Owls Head, a leader of the Schooner Bowdoin Association who sailed to the same area with Admiral MacMillan in 1947. That’s a challenge that delights Captain Chase and his new ship’s company of ten cadets and four crewmen, who are confident of their ship and of their own ability to follow the wake of Admiral Mac and his boys. 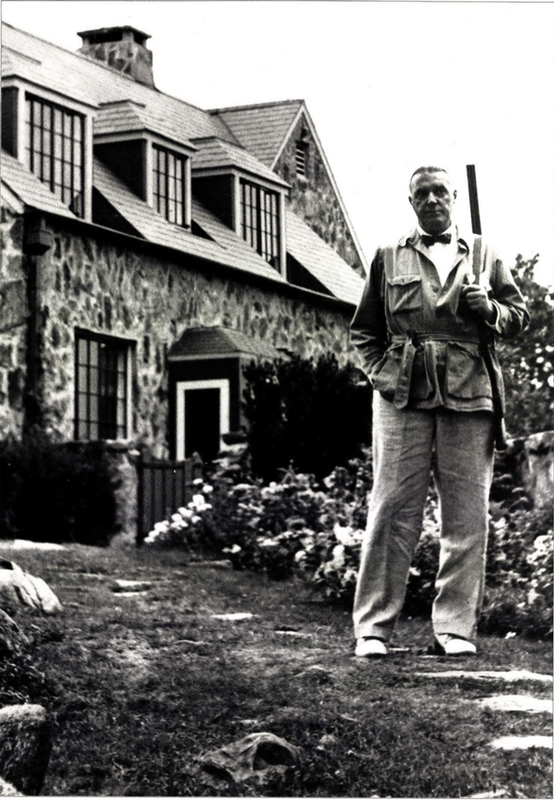 See more Down East archive issues.